vSphere 6.5 now fully supports HTML5! Telmo December 28, 2016 December 28, 2016 No Comments on vSphere 6.5 now fully supports HTML5! The long waited HTML5 support is here!!! VMware previously announced that the C# client would no longer ship with the next release of vSphere. That is the case with the vSphere 6.5 release. VMware continues to move toward Web- and API-based tools, including VMware PowerCLI™ and the new vCenter Server REST APIs. The most used UI probably is the vSphere Web Client. This interface continues to be based on the Adobe Flex platform and requires Adobe Flash to use. However, VMware has continued to identify areas that will help improve the user experience until it can be retired. Through several outreach efforts over the past year, the Engineering group has identified high-value areas where customers most seek improvements. The following high-impact improvements will enhance overall user experience with the vSphere Web Client while development continues with the HTML5-based vSphere Client. First, the inventory tree, rather than the home screen, is now the default view because it is the view a vast majority of administrators have gone to first when logging in. The home screen has been reorganized based on customer feedback. Optional plug-ins have been moved to the bottom, out of the way. Another important change is the renaming of the Manage tab to Configure. It is now more intuitive as to which operations can be performed under this tab. And to be more in alignment with expectations of administrators, adjustments have been made to the locations of some settings and workflows. The Related Objects tab has been removed and flattened into Hosts, VMs, Datastores, and Networks, to make the UI more intuitive and reduce the number of clicks to complete administrative tasks. 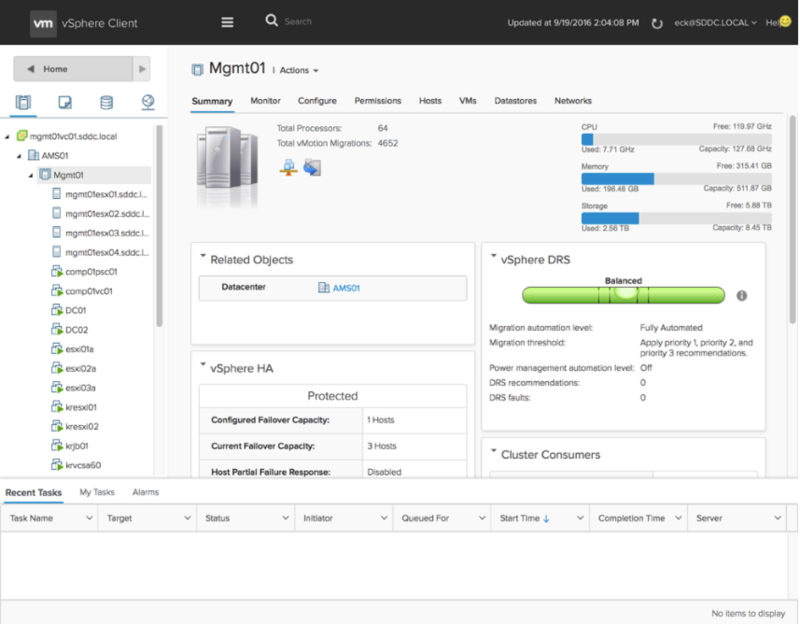 From a performance perspective, VMware has made improvements that will enhance the user’s experience with the vSphere Web Client. Additional enhancements have produced an increase of 100 times in the number of VMs that can be displayed in the inventory tree. A significant enhancement is the live refresh ability. The vSphere Web Client can now be viewed as the single source of truth in real time for operations within the environment, automated tasks, tasks of other services, as well as activities of other administrators. Power states are also reflected in real time, enhancing the user experience with the vSphere Web Client. 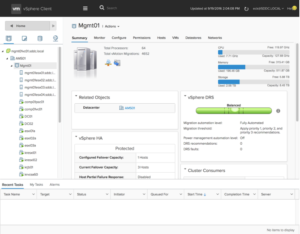 vSphere 6.5 and VMFS 6, What’s new?